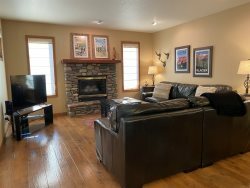 This newly remolded condo is in the heart of one of Montana’s finest ski resorts. The resort links you to 3000 acres (98 trails) of world class skiing. This is a great place for a family of 4 or a romantic getaway. There is a king size bed and a pull out couch in the living room. Beautiful kitchen with all new appliances and utensils. Heated ski locker. There is WiFi, cable and telephone. There are several restaurants within walking distance varying from bar food to a 5 diamond restaurant. There is a snow bus that takes people to town every hour. You can explore the area without having to drive. When the snow melts, Whitefish Mountain Resort becomes home to thrilling zip lines, an alpine slide, downhill and cross-country mountain biking, and the unique walk in the treetops. With spectacular hiking, golfing, water sports, fly fishing, whitewater rafting and Glacier National Park, it is the perfect base camp for a summer visit to Montana’s majestic Flathead Valley. Just a short 10 minute drive to city beach in Whitefish to enjoy all the lake activities! You're a 35 minute drive to the West entrance of Glacier National Park. Just a 10 minute drive away is beautiful historic Downtown Whitefish. If you enjoy shopping, great food and a fun nightlife this is the place for you! There are many clothing, souvenir and antique shops for you to relish in. Take pleasure in some of the finest restaurants that the Flathead Valley has to offer! There is parking out front of the Sherpa building. *No pool or hot tub for guest use.